Here�s holiday luxury you�ll feel right at home with. 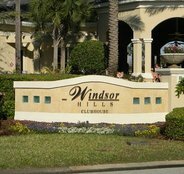 Windsor Hills is a superb 24 hour secure gated community located 2..5 miles from Walt Disney world. Our 5 bed roomed, 5 bathroom executive villa comes with it's own glorious heated Swimming Pool, Spa, and Jacuzzi, extended pool deck with luxury south facing pool and patio furniture, to laze away those hot sunny days, with the sun on the pool deck from sunrise to sunset you wont want to venture far. 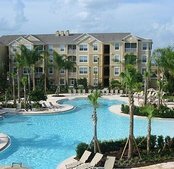 It�s so close to Championship golf courses ( next door to Mystic Dunes, and within only five minutes to Reunion and Championsgate. 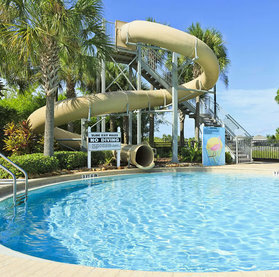 Windsor Hills offers all of the amenities you would expect in a five-star community complex, including a double Olympic size swimming pool with a water park including Dueling Slides, an interactive kid's splash zone complete with 2 slides, a water wheel, water cannons and water sprays! The project was capped off with a new oval hot tub and expanded deck space. A palm tree lined sun deck with luxurious lounge chairs. 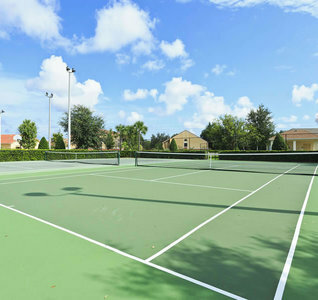 Not forgetting state of the art fitness center, games room with billiards and table tennis , video arcade, grocery and sundries shop, and movie theater. 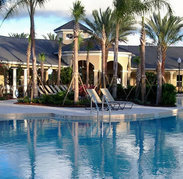 What�s on your wish-list for a luxury holiday in a perfect Florida villa? 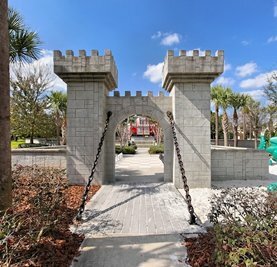 A stunning, 5*, ultra-modern, 5 bedroom (including two King and one Queen sized suites), 5 bath roomed home only minutes from Disney complete with a large, covered and heated pool, Spa and Jacuzzi - and all set in a perfect Florida location. 3,000 square ft. of air-conditioned living space (ensuring you can lose the kids when you want to). Flat screen TV 's in all rooms (including a 52� flat screen in the lounge). Hundreds of channels including premium and sports. 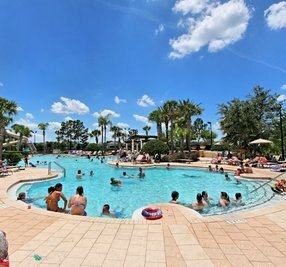 The gorgeous Florida sun shining on your pool from sunrise to sunset. Themed children�s bedrooms, Harry Potter's Hogwarts and Tinkerbell, both with their own bathrooms. A state of the art kitchen that includes an American fridge freezer (with ice maker), microwave, dishwasher, cooker and all the utensils and crockery you could ever need in stainless steel. Separate breakfast and dining areas. A range of superb silk-covered furnishings, striking curtains and pillows you can fall into. Free local phone calls,and wireless internet access, Play Station 3, and wifi in the purpose made games room. 1500 sq ft of decking with contemporary patio furniture. Safe, secure gated community complete with 24/7 guarded gates. A large games room complete with pool table, air hockey and ps3. Smoke alarms, fire extinguishers and emergency lighting. Archfeld Blvd on the newest section, "The Reserve"
We can accommodate 10 adults plus one baby in our crib. Tinkerbell and Harry Potters Hogwarts themed bedrooms for our younger guests. Please note: due to time zone differences we only communicate by email. We have been doing this for years and it works very well. Both ourselves and our guests have everything in writing, which protects us both. The weather was fantastic during our stay. Everything at the home was great. We had a great time on our vacation and staying at your home. Your home was absolutely beautiful and just perfect. 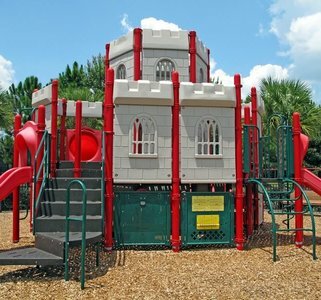 Your home was very comfortable and very well equipped with nice amenities. Hello, we want to thank you for opening your home to us. And we look forward to booking with you again. We are heading home and already miss it... lol... kids loved the pool. And yes the maintenance people came on Tuesday and fixed the spa heat.